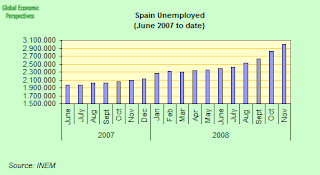 As Spanish Unemployment Rises Sharply Again, Just When Did Spain Enter Recession? 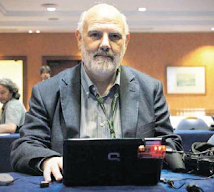 The number of people presenting jobless claims in Spain soared to nearly 3 million in November, following a 6 percent rise in registrations over October, providing us with yet further evidence, if we needed it, of the gravity of the situation which is now unfolding before our eyes. The Spanish Labor Ministry stated that an additional 171,243 people signed on for unemployment benefits last month, bringing the total to 2.99 million. Year on year the increase was of 42.7%. Obviously it is hard to make exact forecasts for how the situation will evolve, but on a rough and ready (back of the envelope calculation) basis - which is as good as any here, since the degree of undertainty is so large - if the contraction continues at the same pace over the next twelve months, then by December we could have an increase of around 50% - or a total of about 4.5 million (15% of the labour force) unemployed, and rising, of course, assuming we won't hit bottom in 2009. Basically, since I assume the contraction continues at the current rate (ie no further acceleration in the contraction on average, and no significant deceleration) then this is what you might call the median forecast, where upside risks and downside risks more or less balance. Clearly the situation could be worse than this, but then again it could be better. My instincts tell me that the rate of unemployment creation will accelerate over the next six months, as industry takes a terrific beating, but then may slow down in the second half. But then these are only that - instincts, or guesses. Nevertheless I have little doubt that unemployment will still be rising when we reach December 2009, since the earliest this can hit bottom will be in 2010, and even horizon this isn't a sure thing at this point, given the downside risks which are floating around. 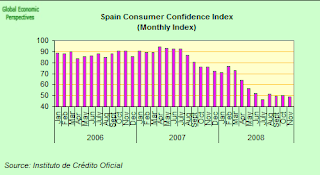 Spanish consumer morale also fell back again in November, reaching 48.7 from the 50.1 registered in October - according to the latest data from Spain's Official Credit Institute (ICO). The result is hardly surprising given the way layoffs have been soaring and the economic contraction deepening. Consumer confidence, which was at 76.1 in November last year, hit a record low of 46.3 in July just as European Central Bank rates interest rates to a cycle high of 4.25 percent and oil prices hit a record $147 a barrel, since which time they have bounced back slightly. Confidence was down in most of the main index components, although we might like to note that it is the sub-component referring to expectations for the economy going forward which is the main factor keeping the index up above the July level. In particular the outlook for the economic situation of the country is well up above July, which is surprising since during this time the economic outlook has evidently deteriorated. Could this be a case of a "we didn't get an earthquake today, so maybe one tomorrow is now more likely" type rule application, with the idea being that things have gotten so bad, that surely they now have to get better, especially with oil prices coming down. Self perpetuating wishful thinking would be another way to describe this thought process, since nothing could be farther removed from reality, unfortunately. Still, we should bear in mind that any reading of less than 100 on this index (which was only started in September 2004) indicates pessimism dominating over optimism, and whichever way you look at it we are certainly well below 100 at this point. Just When Did Spain's Recession Actually Start? "A recession is a significant decline in economic activity spread across the economy, lasting more than a few months, normally visible in production, employment, real income, and other indicators. A recession begins when the economy reaches a peak of activity and ends when the economy reaches its trough. Between trough and peak, the economy is in an expansion." So leaving aside all the politically embarrasing awkard little issues of just how you decide on how to call a recession in terms the general public can understand, what really interests economists is the business cycle process itself, and identifying the peak (the moment when one cycle draws to a close) and the trough (the moment the next cycle begins). And again leaving aside the evident asymmetry in the popular discourse on the topic (namely that people are clearly far more prone to overanticipate when it comes to determining the trough than they are when it comes to the peak), identifying both peak and troughs is important since it should enable us to make more appropriate, targetted and effective decisions in both the monetary and fiscal policy areas. So the economic nitty gritty here is, OK, two consecutive quarters of contraction does constitute a nice "rule of thumb" guide, but far too often, the devil is in the details, and this kind of simple rule of thumb simply does not get to the heart of the matter. And to validate this argument even further, let's take a look in the Spanish case which is indeed a very interesting one. "Because a recession is a broad contraction of the economy, not confined to one sector, the committee emphasizes economy-wide measures of economic activity. The committee believes that domestic production and employment are the primary conceptual measures of economic activity." That is, they use these two indicators because they feel that they offer (in what is evidently an imperfect world) the best available measure of where an economy actually is at at any given moment in time. Employment I would have thought was an obvious indicator, but domestic output is also important since it strips out all kinds of misleading data-skews which derive from movements on the external trade side. 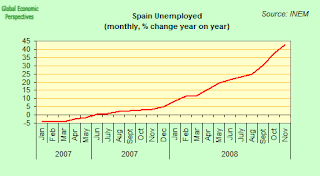 Now if we look at the Spanish labour market in terms of the trend in unemployment, then it is easy to see in the chart presented above that the annual change in unemployment altered trend around June 2007. Up to that point unemployment had been falling, while subsequently it started to rise. 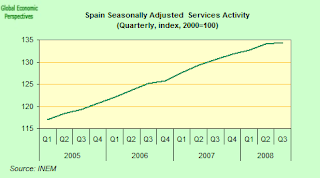 Now if we turn to the seasonally adjusted employment data prepared by the INE for the national accounts we find, well surprise-surprise, that the number of people employed in the Spanish economy reached it peak between July and September 2007 (the third quarter). 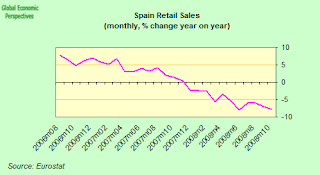 So the Spanish labour market definitely turned in the summer of 2007. 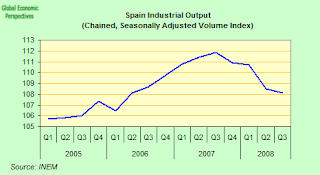 Well here we could simply consult the INE's seasonally adjusted quarterly industrial output data. And guess what we find, well yes, you guessed, the series peaks in the third quarter of 2007. Now obviously industry is only one part of domestic output, although it is remarkable to note how this sector, and not only construction, started to decline after the summer of 2007. This seems to suggest that Spain, right from the start, was having something more than a "housing slowdown". On the other hand, the services sector, as I argue in this post, did hold out somewhat longer, and as a result the cycle peaked somewhat later in this sector, possibly during the first quarter of 2008, although aggregate services do seem to have continued to expand - even if at a very slow rate - right up to the third quarter (which just shows how difficult it is to get a really precise measure on a process like this), and this may explain why so many "Spaniards in the street" have been going round saying "crisis, what crisis, I see no crisis, the bars and restaurants are full..."
Since services account for over 60% of the Spanish economy, this is, of course, more than just a detail. 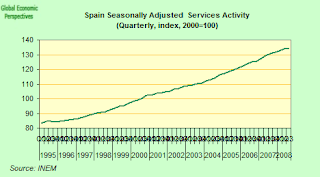 Then again, if we look at the entire path of the Spanish services sector since Q1995 (which is when the INE time series begins) we can begin to get an idea of just how significant this "peak" is, and how it is obvious we are now in for a major correction (since the upside has been so large and extended, or you could say "distorted"), and how talk of a short term setback is completely off the mark. Basically Spain's current "business cycle" has run from the last quarter of 1993 till the summer of 2007, which is, well, "one hell of a business cycle", and the question we will now have to get down to is just why it has been like this, especially if the correction is, as seems likely, a lengthy and painful affair. Let us hope that at least we will be able to say in the future "once bitten, twice shy". If we move from the production over to the demand side, then of course one very useful measure of domestic demand is provided by the volume of retail sales. 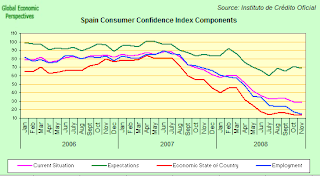 In Spain the relevant index, in fact, peaked in November 2007. And since the year-on-year measure turned negative around the same time, it is not unreasonable to suggest that domestic demand was entering contraction at around this point. 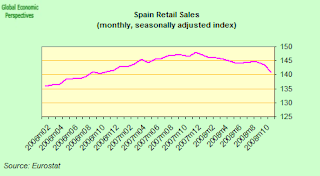 It is important to remember here that Spain had been experiencing a mild "housing slowdown" for some months before the financial turmoil of the summer started to bring things to a grinding halt (see more on this below), and the effect of this slowdown can be clearly seen in the year on year retail sales chart in the months prior to the summer of 2007. Retail sales momentum had clearly passed its expansionary peak in late 2006. So, what am I doing and what am I not doing here? 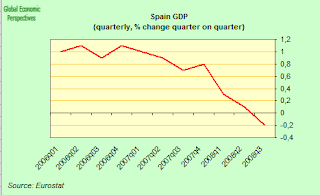 Basically there is no doubt that for historical record purposes the 1 July 2008 will go down as the date the Spanish economy entered the current recession (or whatever it is we finally decide to call what is happening at the present time). But for economic analysis purposes we should be aware that the last business cycle very clearly turned, and went past its peak (thus "entering" recession in another sense of the term) not in the summer of 2008, but rather in the late summer of 2007 (on my best estimate, but then I am not a committee, and I have no authority whatsoever here), and thus, if we had all been a little less worried about defending our rears, and a little more concerned to actually get something done, they obviously the large structural problems which now lie out there before us could have been gotten to work on much earlier. In particular both fiscal and monetary policy could have been made more appropriate from a much earlier point. If we look at the evolution of headline GDP itself, we can clearly see two "breaks" in the data, the first in the middle of 2006, representingwhat we could call the "housing slowdown". This was evidently provoked by the interest rate raising cycle at the ECB together with the rising cost of mortgages and the impact of both of these on growth. The second break is alos clear enough even for the untrained eye, and comes in the second half of 2007 (following the closing of the wholesale money markets to Spanish financial products), and this is when, in any meaningful sense, the long boom in the Spanish economy really and decisively reached its peak and the downturn - or recession as defined by being "a broad contraction of the economy, not confined to one sector" - really got underway. Remember, a car travelling at 120 Km per hour on the motorway which runs out of petrol can still roll on for another couple of kilometres before coming to a complete stop. Lastly it is worth pointing out that one of the principal reasons the internal demand contraction didn't show up so clearly in headline GDP data was the simultaneous evolution of the external trade balance, which, while remaining very negative, lessened as we moved through the quarters. This was becuase exports have continued to increase while imports - despite a very large increase in oil prices - have remained almost stationary (see chart above). Thus the net impact of external trade on recent q-o-q GDP has been - ironically - positive, even though the substantive impact over time is hugely negative. I mean, going back to the car, try putting the handbrake on hard, shoving the thing in first gear, accelerating like mad, and then easing of the handbrake slightly. The handbrake is still breaking, but off you go shooting forward. This is what reducing a negative influence can mean. Be careful you don't have a wall in front of you when you try this. Another thing we need to think about here is that as the external environment deteriorates further (global recession in 2009 etc) this positive boost from exports may well not last too long (at least in the short term - although in the longer run this increase in exports is precisely what will be needed, although, again as is clear in the chart, getting exports to catch up with, and ultimately overtake, imports is going to be quite a long haul process for the Spanish economy). So basically, depending on how much further imports fall, the "positive external trade effect" may well be a very short lived one. 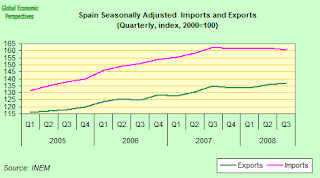 Returning, in conclusion, to the main topic of this brief review, Spain's long boom, just how long the run up has been is very clear indeed from the final chart I present. The point is here, I think, we now know where the peak was, but we don't know how long it will be before we see that employment chart turn up again, and even more to the point, how long it will be before Spanish employment gets back to the levels which were being enjoyed in the Summer of 2007.